Since optogenetics burst onto the scene in the early 2000s, brain researchers have embraced the technique to study functions ranging from sleep and hunger to voluntary movements and sensory input. The vast majority of these studies have been conducted in rodents, and much has been learned, but extrapolating to humans from a species so different from us poses a challenge. 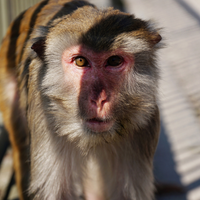 Brain research in nonhuman primates precedes optogenetics by decades. Attempts to understand the links between brain function and behavior have relied on techniques such as inserting an electrode into the brain to activate or interrupt neural signals, and creating lesions to disrupt pathways. But these approaches only reveal whether the altered brain regions are involved in the functions being studied, with little detail about the types of cells or networks involved. Controlling neurons with light (optogenetics) or chemicals (chemogenetics) offers researchers a much more precise way to study brain function. Optogenetics utilizes a microbial protein known as channelrhodopsin (ChR), a light-activated ion channel. When inserted into animal cells under the control of a cell type–specific promoter, the protein is expressed in subsets of neurons, and a beam of light can be used to trigger its activity, spurring those neurons to action. Chemogenetics deploys chemicals rather than light. Cells are engineered to carry DREADD (designer receptors exclusively activated by designer drugs) pro­teins, which are then activated by a drug that doesn’t otherwise affect animal metabolism. Rodents are often genetically engineered to encode ChR, DREADDs, or other controlling elements. 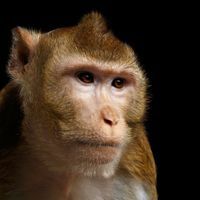 But so far, genetically modifying primates has proven more difficult and expensive, limiting researchers to using viral vectors for delivering genes for these proteins to the brain. These vectors are generally derived from adenoviruses, says Jessica Raper of the Yerkes National Primate Research Center. 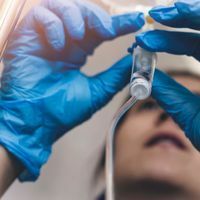 “Just like humans, nonhuman primates can have neutralizing antibodies for these viruses, so any method must prescreen for antibodies specific to the serotype being used,” she explains. The larger primate brain also requires larger amounts of vector to be injected directly into the brain, sometimes in multiple doses that may damage tissue. Furthermore, delivering light deep into the brain requires inserting an optical fiber, and chemicals designed to activate inserted genetic sequences must be able to cross the blood-brain barrier. (See “Getting Drugs Past the Blood-Brain Barrier”) That means much more trial and error than in mouse studies. “There’s no universal solution for primates as there is with the host of genetically modified rodents,” says William Stauffer of the University of Pittsburgh. Nonetheless, several recent studies have managed to probe the function of specific brain regions or cell types in rhesus monkeys, marmosets, and other primates using optogenetic and chemogenetic tools. Here, The Scientist profiles some of these recent efforts. Approach: Previously, Stauffer and his colleagues had targeted dopamine neurons in rhesus macaques using a two-vector strategy: one vector carried ChR in a form dependent on the enzyme Cre recombinase for activation, and the other carried the gene for the enzyme. Expression of Cre was controlled by a promoter specific to dopamine neurons, so ChR would only be activated in these cells. (Cell, 166:1564-71, 2016). Horwitz and his colleagues built on this approach to design a single-vector system extendable to other cell types. They constructed an adeno-associated viral vector in which ChR was controlled by a promoter known as L7, which is only active in cerebellar Purkinje cells. “Our idea was to use a virus that would infect many types of cells, but use a promoter that would only affect a very specific set of cells,” he says. The team inserted an optical fiber near the injection site; activating cells with light produced strong neuronal activity in the Purkinje cells and altered a specific kind of quick eye movements within 15 milliseconds. “To study the kinematics of movement, you need a manipulation that will work fast, and it’s gratifying to see that this one does,” Horwitz says. To see precisely which neurons were being activated and causing the change, the team fused the opsin to a red fluorescent protein, and confirmed that the proteins had localized only to Purkinje cells in the cerebellar region being studied (Neuron, 95:51-62, 2017). What’s next: Investigators will need to identify the best viral vectors and constructs for extending the method to other cell types. Few cell type–specific promoters have been characterized in monkeys; ones from mice or other species can offer some leads. Without well-characterized promoters, “it’s a much harder road,” Horwitz says. Problem: The orbitofrontal cortex in rhesus monkeys encodes information about properties of and preferences for rewards, while the rhinal cortex carries information about stimulus-reward connections. Previously, Richmond’s team found that disrupting links between these two regions in monkeys led the animals to make errors when estimating the size of an expected reward after a task. But with the conventional method of creating lesions, the researchers could not reversibly disconnect the two regions to further test why these errors occurred. Approach: The team created a lentivirus vector carrying a gene for a DREADD protein that silenced neurons when treated with a chemical called clozapine N-oxide (CNO). Expression of that DREADD protein is in turn controlled by a neuron-specific promoter. The researchers first removed the rhinal cortex from one side of the monkeys’ brains, then trained them to associate a particular stimulus with a reward. The animals then received injections of the viral vector in the opposite orbitofrontal cortex and were tested on the task. When activity was silenced using CNO, the animals could not discriminate the size of expected rewards and made more errors in calculating reward size, suggesting that connections between these two brain regions help monkeys remember and gauge the relative value of different rewards (Nat Neurosci, 19:37-39, 2016). The key to the technique is titrating the optimal amount of drug. The researchers also turned to positron emission tomography (PET) imaging to observe DREADD expression in vivo and see how much CNO was needed to induce silencing. For both optogenetic and chemogenetic methods, getting sufficient penetrance in the monkey brain, which is much larger than that of rodents, is a challenge. 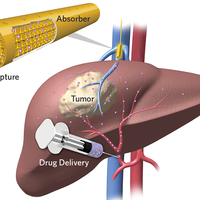 With chemogenetics, an additional issue is using drugs that cross the blood-brain barrier. Extending the method: To apply the method to other brain regions, PET imaging is useful for ensuring that DREADDs are expressed in the correct area or cell type, Eldridge says. But this is expensive, challenging, and requires chemists to synthesize the radio-ligands needed to image tissue. As an alternative, researchers could check DREADD production with histology, he adds. Whether CNO works in primates and what dose to use needs more testing. Although Richmond’s team found good results with intramuscular drug injections, recent rodent studies have found that CNO’s activity is actually mediated by its metabolite clozapine, which can bind to other receptors. In primates, Raper and her colleagues reported that CNO does not cross the blood-brain barrier as effectively as clozapine does (ACS Chem Neurosci, 8:1570-76, 2017). 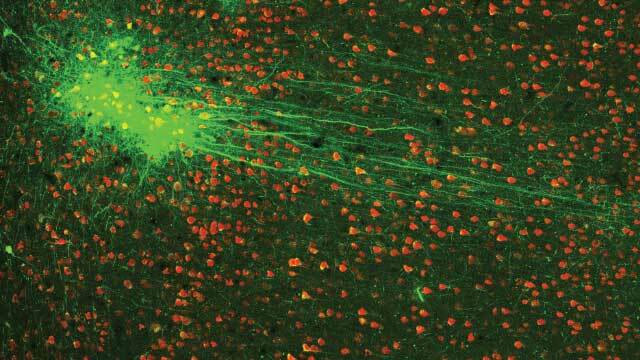 Problem: Viral vectors injected into the brain aren’t selective: they infect cells at random. Researchers can use unique promoter sequences to target specific cells, but not all neuronal subtypes are well characterized at the genetic level. Approach: To selectively target one subtype of neuron and understand its activity, Galvan and her colleagues began by injecting adenoviral vectors carrying ChR into the motor cortex of rhesus monkey brains. The opsins were expressed in cortical neurons projecting into a variety of brain areas, but the team could selectively activate the pathway of choice by altering the placement of the optical fiber. Placing the light source at different points would thus activate different circuits. “So we activated selected brain regions, not specific cell types,” Galvan says. 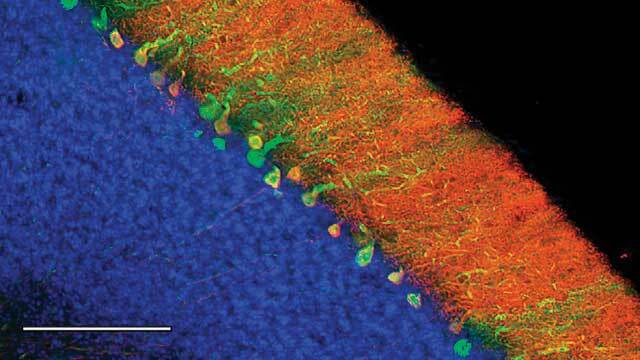 Teasing apart these distinct roles would have been difficult with an electrophysiological approach because the cortex and thalamus are reciprocally connected. “If we were to just electrically stimulate, we’d see activation of both pathways simultaneously, so it would be very difficult to see what’s going on,” Galvan says. Most previous studies have focused on sensory areas of the cortex and thalamus, but her study suggests that in the motor areas, these two regions interact in a distinctive way (J Neurosci, 36:3519-30, 2016). Expert tip: When relying on light to activate specific brain regions, make sure that illumination does not spread out of the brain region of interest and activate ChRs that may be expressed in other areas, Galvan says.